TotalKare, the UK’s number one supplier for heavy duty vehicle lifting solutions and aftersales care, has been supplying mobile vehicle lifts to the UK market for over 35 years, selling more than 6,000 sets of mobile lifts to customers ranging from multi-national operators to independent workshops. 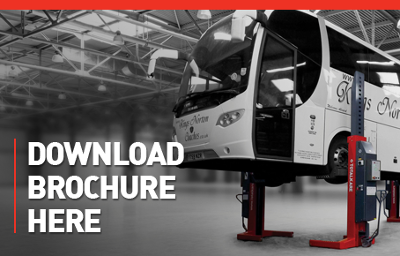 Why choose TotalKare Heavy Duty Workshop Solutions? Besides the proven track record and experience of serving the heavy duty workshop industry, and its range of market leading products, TotalKare’s key strength is that of its staff. TotalKare manages its national service and commercial operation from its headquarters in Halesowen, Birmingham, from this central location in the UK the company’s aim is to add value to you and your business. TotalKare's national approach to customer care has been proven over the years, with in-depth expertise across all sector applications. All engineers, account managers and back office support share the common goal of providing an unrivalled customer experience and adding value to clients' businesses through market-leading solutions.